Melt 15g butter in a large pan. Add 1 sliced leek, a pinch of saffron and the drained, rinsed chickpeas from a 410g can. Season, cover and cook gently for 10 minutes, until the leeks are soft. Pour in 300ml whole milk and heat to scalding point. Cut 750g skinned, undyed smoked haddock into large chunks and push under the liquid, so they are covered. 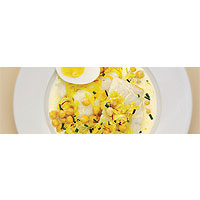 Poach for 5–7 minutes, until the fish flakes easily, then gently mix in 4 tbsp double cream. Season and serve with snipped chives and soft-boiled egg.